Had a presentation in class that didn’t go as well as I hoped. Felt like a fool. Spending some moments this evening noticing my reaction. I think it is good to name and identify the feelings that come to the surface. Same class, related item. Someone asked me (being kind to my tech skills) why I don’t have a computer job. “You should work with computers.” I know it is a compliment, but something inside me wondered “is she saying I shouldn’t be a priest?” Was a very small voice, but one that identifies the fact that I have been thinking a lot about ‘calling’ lately. So much work to be done before the end of semester. It’s tiring and exhilarating. I spent rather longer this afternoon (after a three hour lecture) finishing off a jigsaw puzzle in the college library. As a puzzle, it has taunted students for a while now – it has been quite a challenge. I think working through the puzzle was somehow therapeutic though… I have been thinking a lot about the nature of my own call to ministry – how do I recognise God’s leading in my life? I thought about the challenge of finding the “right fit” for a piece. There are many places that a particular jigsaw piece could be made to fit. Sure, it might jiggle a bit, but it fits, right? There’s nothing quite like the snugness and satisfaction of the right fit. Persisting with something that doesn’t fit will only make make things more difficult as you move onto the next piece. Finding the right fit sometimes comes as a surprise. It’s not always the piece that you thought would fit there. But as the fit happens, it is an immense “aha” moment and the picture becomes more clear. Knowing the difference between a right fit and a wrong fit means trusting the quality of the puzzle. Making some key finds unlocks some other pieces to be placed with confidence. Sometime you make quick successive moves. Other times nothing seems to fit. Have patience. Keep trying and looking. If necessary, just work successively through all the options. Sometimes it’s much more about persistence than some imagination of personal brilliance. Sometimes you encounter serious doubt that all the pieces are present. Trust the process. Sometimes there is nobody present to cheer you on when you place your final piece. Appreciate the feeling of personal satisfaction. But not too much… many other people also did good work in getting this puzzle completed. Placing the final piece is really no more important than placing the twenty-seventh piece. But without deeper reflection one knows from daily life that one exists for other people; first of all for those upon whose smiles and well-being our own happiness is wholly dependent, and then for the many, unknown to us, to whose destinies we are bound by the ties of sympathy. A human being is part of a whole, called by us the “Universe,” a part limited in time and space. He experiences himself, his thoughts and feelings, as something separated from the rest -a kind of optical delusion of his consciousness. This delusion is a kind of prison for us, restricting us to our personal desires and to affection for a few persons nearest us. Now, where do essays fit into that description? I am now a third year student at St Johns. It seems hard to believe. But my time here is short. At the end of June I pack up all my belongings and move down to Pahiatua where I will be beginning a two year curacy (think apprenticeship) with the local Anglican church. Over time I have become very fond of this place. St Johns really is a special place. Great community, great surroundings, great conversation. Of course, it drives me mad. It frustrates the heck out of me. Sometimes it makes me angry. But I love it, and I will miss this college greatly when I leave. Why would I ever want to leave? And at the same time, there is fear of the unknown. What will Pahiatua be like? Will I like the people there? Will they like me? Can I live up to their hopes for me? (Of course I can’t.) Will they live up to my hopes for them? How will small town life shape me? Of course I am excited by the prospect. Thrilled even. It will be so good to have the privilege to journey alongside a new community. So at the moment I live in a strange space. Change looms large on the horizon. I need to start thinking much more seriously about the practicalities of buying a car and sorting through my stuff. But at the same time, my work here at St Johns is not yet done. I am convinced that these next few months are an opportunity to be grasped. Thought I would upload a few photos from around Christchurch Cathedral that I took during my time there in November-December 2010. Such a privilege to have spent time working there, exploring the corners of the building. A reminder to me that each moment we live is a unique moment in history. We will never live this today again. I hate to miss a good funeral. Of all my life regrets, missing the funeral of someone I have loved or respected would be one of my strongest. Today as I enjoyed my penultimate CPE group session, presenting our end of chaplaincy reflections to the group, I was also keenly aware that I was missing the funeral of Andrew Duxfield in Tawa. I spent much of the afternoon thinking of Charmaine, Michael, Kelly, Tim, Kim, Amy and Rosie. Andrew had taken over as my Boys Brigade captain when the group had fallen into a state of disarray and we feared that the company would close. He shared his faith warmly with us boys, working to build in us a faith that is ‘sure and steadfast’. 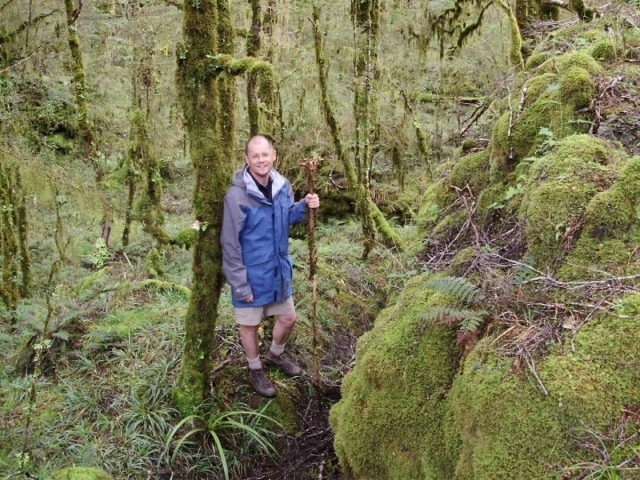 He took us away on amazing end of year adventures around Tongariro and Taranaki, memories of which sit warmly with me. He coaxed me (most of the way) up mountains and helped me get further than I imagined. I wheezed and puffed. He told me I could do it. His adventure filled life and faith continued. I worked with his family as. a youth leader. News last week of his very sudden death in Fiji while on mission work came as a huge shock. Andrew will be missed. I would like to climb those mountains again someday. The organised of my friends have started with the business of Christmas letters already. Perhaps if I were organised I too might write a letter summising my year for friends to reflect on, some form of expository “show and tell” of my life. If I were to write one I might reflect on the difference of starting a second year at St Johns compared to my first year. Gone was the deep grief I felt in 2010 for all the good friends, opportunities, resources and ministry I had left behind in Karori. Somehow 2011 felt different. And I might mention that I got to attend not one but all three New Wine camps, do wave my hands in the air and host sessions, representing the national leadership team. It was fun and scary. I might mention in a christmas letter that a crucial point in my year came in May when I received a letter from Bishop Tom saying that I would be ordained as a deacon in November. Immediately, at the half way point of my time at St Johns I was being reoriented outwards again, to start thinking of the path ahead. I would be amiss if I didn’t make mention of the extent to which the Christ Church Cathedral family have been in my mind all year since the February earthquake. The five weeks I spent there leading up to Christmas 2010 were very special for me, and even more so given the events of this year. Mention must also be given in a Christmas letter to all my dear friends, for and to whom I am very grateful. The community at St Johns (a superb bunch), those connections from Karori, Tawa, Alpha, New Wine, Soul Survivor, Alpha, or elsewhere (many of whom I keep contact with online) and newer friends in Auckland all mean much to me. And I would probably make mention of the events of November 19 when Bishop Tom Brown laid his hands on my head and, somehow, I emerged changed. How or what changed remains a mystery to me, but I know in my bones that it was significant. Closing a fictitious Christmas Letter would be a reflection on the CPE work I am doing at Middlemore Hospital at the moment as a Chaplain on Ward 34, the conversations I am having with people, and the self I am discovering along the way. I would then proceed to, with a lump in my metaphorical throat, to wish all my friends my prayers, blessings and hopes for 2012. May the year ahead be your best year yet.